A bridge reconstruction scheme in Frampton Cotterell has been shortlisted for the Prime Minister’s Better Public Building Award. The Cabinet Office published the list of transport schemes shortlisted today www.gov.uk/government/news/transport-projects-speed-ahead-in-prime-ministers-better-public-building-award-shortlist and the winners are due to be announced on Wednesday 14 October. Mark King, Head of StreetCare and Transport, said: “We are delighted that the bridge has been shortlisted for this prestigious award. In April last year we began installing a new type of road bridge in South Gloucestershire. We commissioned the advanced composite bridge to replace the existing road bridge on Church Road, Frampton Cotterell, which had come to the end of its useful life. “The bridge is one of the first in the UK to be made from layers of glass and carbon fibres bound together with a tough resin in a process more commonly seen in advanced passenger aircraft manufacturing. “The materials used are resistant to frost, extreme temperatures and de-icing salts that can cause problems in steel and concrete bridges, and require no painting or waterproofing. It is estimated that this could reduce the bridge’s maintenance costs by up to 35 per cent over its lifetime. We worked with international design and engineering firm Atkins, specialist bridge designer and manufacturer CTS Bridges, and leading projects firm, Sinclair Knight Merz, to develop the new bridge which was pre-built in a factory before assembly. 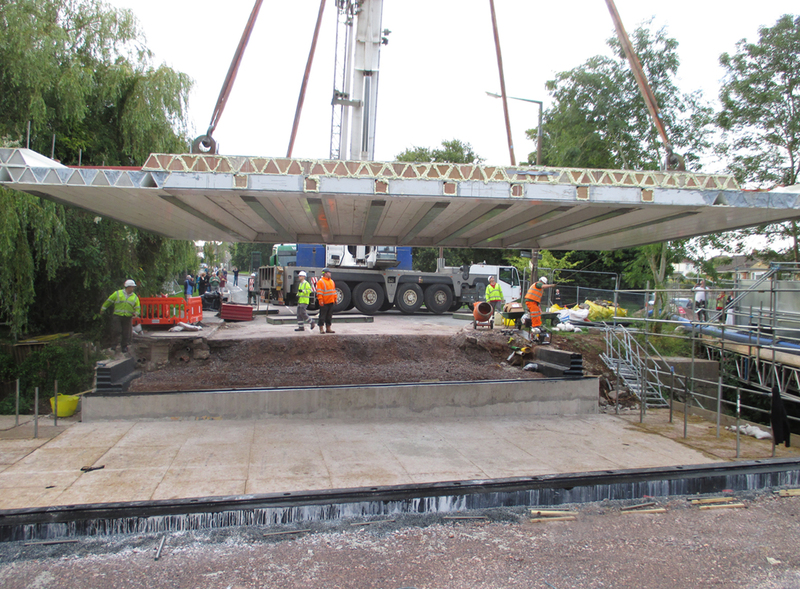 The entire bridge deck was then transported in one piece to Frampton Cotterell for installation. This was carried out during the summer school holidays when traffic volumes were lower.